In this simple sound design tutorial we will do a sizzle effect using nothing but synthesis with the help of U-He Zebra. For this example we will use a white noise module. You can do this with pretty much any synth but I choose Zebra because I love its capabilities and its workflow. This is a pretty straight forward tutorial, so let’s get started. Let’s say you are on a tight schedule and don’t have time to record or have a proper sizzle sound effect in your sound effects collection. The easiest way to create a somewhat similar sound effect is to use white noise. In the first slot of the first lane, load the Noise module (click on the empty slot and select Noise1). Now, this is optional but you can set it to stereo if you want. I prefer it that way. If you press any key on your midi controller, you should hear a white noise. Set the Filter2 (HP filter) until you can hear some mid frequencies. Let’s focus on envelope 1 (ENV1). Disable sustain by setting it to zero, set the attack and decay to your liking. In this example, I’ve also set the release so that the sound has a more natural decay. We will play with that later. In the third slot of the first lane, load the VCF1 and select HP 24dB filter from the filter menu. Set the Cutoff knob so that you can hear high and some of the mid frequencies. I doesn’t really matter if you don’t get it right because we will fix it later. In the fourth slot of the second lane, load the SB1 (sideband or stereo frequency shifter). Set the range to 4kHz and set envelope 2 for the second lane. Set the input to Input 1 (right click on the SB1 and select Input 1). You can copy the envelope 2 (ENV2) settings from the picture but in general you want attack, decay and release to be longer than from Noise envelope. I use this to create the first layer of the sizzle effect. Now, let’s load another noise module into lane 3 and set it below the SB1. While you are at it, set the input to input 2 and set the envelope to envelope 3 (ENV3). You can copy the settings for the envelope 3 but I suggest you experiment with the attack, decay and release. In the Noise 2 module, I’ve set the type of noise to Crackles and I have set the filter 2 to around twelve o’clock. If you disable other modules and just listen to Noise 2 you will hear crackles with some low end. You might have already noticed that the sound pretty much sounds like the sizzle or cooling down sound effect. What you can do now is to add some effects on the FX grid. I’ve added another VCF (VCF5) and set the Cutoff to my liking. I have also added a compressor to make the sound a bit louder. You can play with other effects as well and see what you can come up with. I hope this short tutorial was of some use to you. 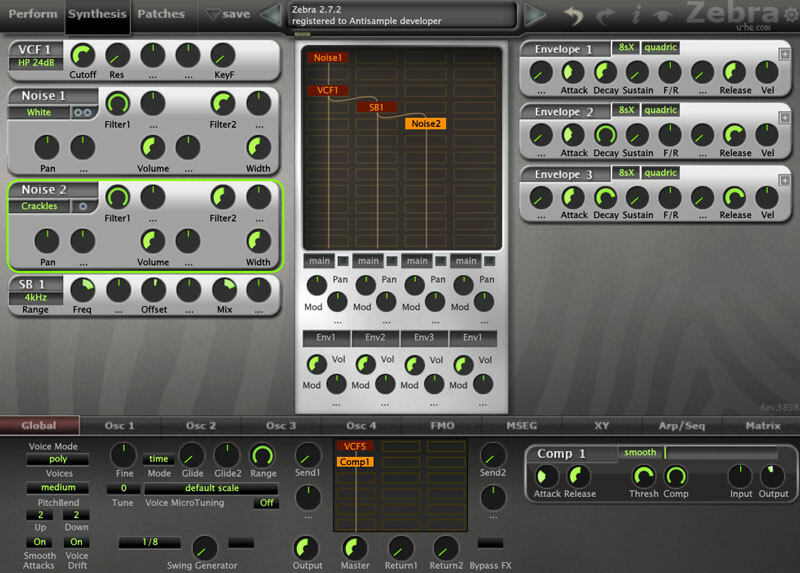 It is really aimed at people starting with sound design and synthesis.